Get the perfect mix between customers and support specialists. Is it management or leadership that gets results? James Schramko with business news update. First thing is, if you have a team or team members, I’d bet they’re capable of more than you think. So my first tip for the average manager is stop being a leader, tell your team the result you want. Tell them what the mission is and ask for their help to help you solve the problem and I think you’ll find more buy it and you’ll see their performance lift and of course the best thing you can do is to have regular communication and keep synchronizing so that you’re always on the same level because if you let them go too long, or if you don’t explain yourself clearly, then you’ll have to step in and micromanage and rework. Do all of the stuff that most managers do. So I encourage you, be a leader. You’re probably familiar with my chocolate wheel philosophy where I put business units together that fit. If you sell websites and traffic and hosting then they’re all things that fit together. And invariably when you have news and updates, people find out what’s going on. The clearest example I’ve got of this is SuperFastBusiness.com if you go there, you’ll see there’s a bunch of different channels that people can click on. So every time I send a news update to that blog, people invariably find out about my other offerings. Now what I’m doing for the first time ever is I’m opening up my SilverCircle intensive workshop to the public in September and I’m running a 1 day workshop at a private secret location where you can find out how I do it. I’m actually going to show you the site, the thinking behind it, the way that it actually works behind the scenes, statistics, and you’re going to see me create a video like this for the weekly newsletter. You’ll see how I load it up, edit it, send out the email, pin it, YouTube it, iTunes it, you’ll see the whole process live from me at my own venue. So that’s coming up, be sure to check out the link right near this video how you can become part of that private workshop. It’s strictly limited by numbers because of the venue so you want to make sure you get into that quickly. As soon as you possibly can. It will be full. Vitally important as your business grows is to grow your service and support team to cater for it. 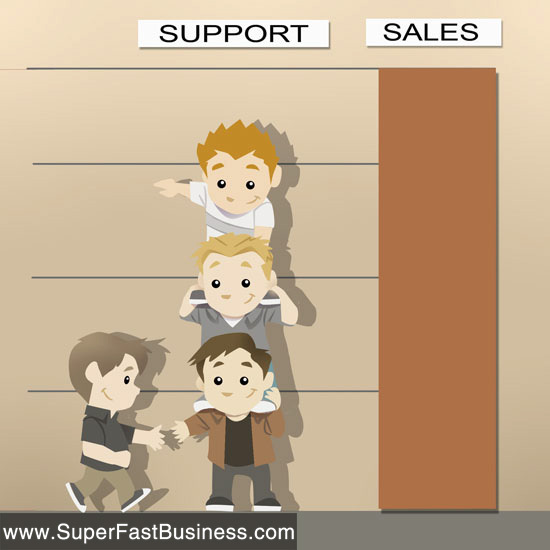 You often hear of businesses where they grew too fast and their support was lacking. You know what it’s like to put in a ticket or you phone up a business and they don’t get back to you for days or weeks and it makes you feel badly about that business and you probably won’t deal with them again even if you never mention it to them or to anyone else. You won’t deal with them and that’s costing them a fortune. Work out the ratio. For me I know as we grow every X-ten thousand dollars I know I need to add every X amount of support. As we’ve grown our business, our support team has grown to cater for that because you want to keep the ratio good. Support is vital especially now with marketing and advertising costs being difficult to both measure and track, you want to retain the customers you have. You also want to presell and post sales report so that they stay with you and they feel good about your business and they tell other people. And make sure you’ve got feedback mechanisms in place. And tell your service support staff that there are feedback mechanisms and share the results with them because they are stakeholders in your support mission. They are involved in giving that customer a good or bad experience so make sure they’re involved in the end feedback and keep it as a loop. Stick with service, grow your service capacity and put some of your marketing budget instead of acquiring new customers, put it towards serving the customers you’ve already got better. Some business missions take time. If you look at the founder of Amazon, took him about 7 years until he turned a profit. Hopefully most business owners don’t have to go that long for profit. But keep in mind, some things aren’t just implement today get a result tomorrow things. Some things you chip away at for months or years to get a substantial result. But celebrate these difficulties and here’s why. Because if it takes you months or years, it will take your competitor months or years to replicate what you’ve got. That’s how you differentiate by going where other people are afraid to go or sticking with something a little bit longer than the average person can stick at it. You will get a result. I’ve been at this business thing for about 7 years now it didn’t happen overnight. But what I’ve got I’m proud of and I’ve worked hard for and I know that a lot of people won’t have the persistence to put in what I put it. I’m going to be pushing harder for the next year or two to make sure that my 10 year gap is so big that it’s going to be really hard for people to just come and take my space. I want my space and I’ll fight for it and that’s why I’m determined. That’s why I put these videos out every week and my SuperFastBusiness.com website is now growing to that 20,000 visits per month with 33,000 page views. That’s because of sheer persistence and determination. And I’d like to see you do that in your business. In fact comment below this video and tell me what you’ve done as a result for watching; my continuous deployment of these videos. What have you started in the last 2 or 3 months that you’re proud off? Share it with the rest of the community here. Final tip for today is about videos. You know I’m putting a lot of videos out there. I’ve put over a hundred videos on my SuperFastBusiness channel and what I’ve learned is just about anyone will watch a 2 – 3 minute video. So if you have something important to say, make sure you get it out within 2 – 3 minutes and you’ll find your audience. If you make it 15 or 20 or an hour you’ll probably get some severe drop off. Some of my sales videos are now down to 1 minute and 30 seconds and everyone watches to the end. So there’s my tip. Short videos are effective for engagement, so get your message out in the shortest possible timeframe. Hope you’ve enjoyed this business news update and I’ll be back next week with your next instalment. Have a great week. Great video James. Im studying about the difference between management and leadership at the moment. Would you say expert Leadership is something your born with or can be learned from scratch? Nathan I am sure you can learn leadership. James, thank you for the tips and the encouragements. I heard about your business from I Love Marketing a few months ago. Since then, I’ve been working on my website on my days off and studying about content creation after work and on my weekends. My website is almost ready and I’ve created 4 workout videos. Your story of success runs through my mind every time things seem to get harder. You are one of my leaders! Trang thank you so much. I am sure you will do really well with this effort! Hi James, to create my links to my site I have been writing online articles for home reno and sevice directory websites with high page ranks. I am currently having between a 5 & 10% increase in traffic to my site with these. I got the idea after listing to one of your previous posts. I love your work and thanks. Well done Matt. Posting quality custom content on themed / relevant sites is a winner! I like the idea of pushing harder than your competitors… when i started my business, it was so hard the first 4 years, but now I am getting the results and my lifestyle has just upgraded so much!